Split point and 135° point angle for optimum starting. Penetrates quickly and is excellent for hard materials. Less breakages and longer life. Sizes: 1-10mm in 0.5mm increments. 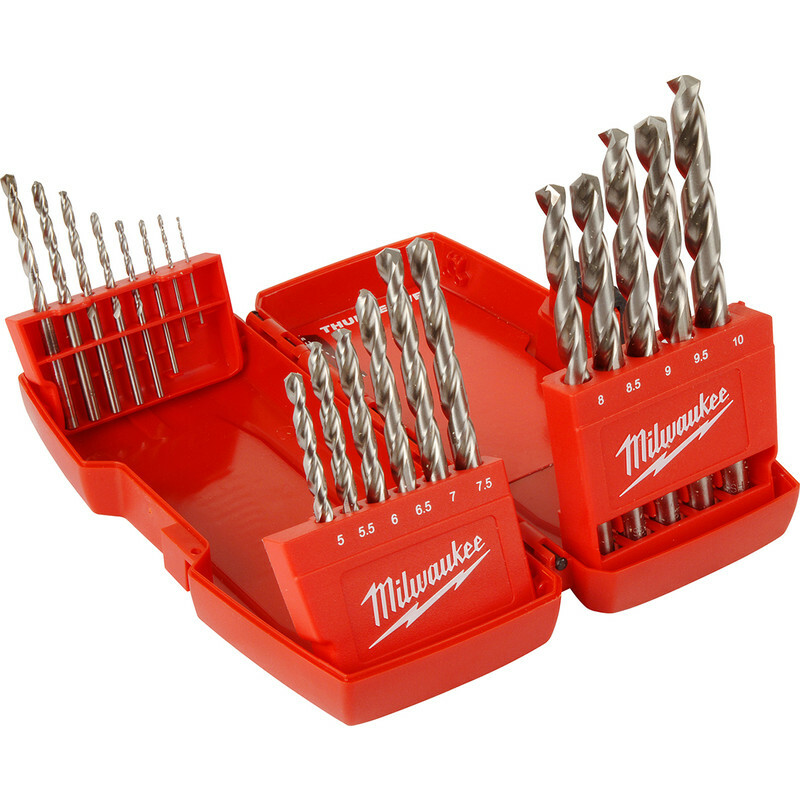 Milwaukee Thunderweb HSS-Ground Drill Bit Set (19 Piece) is rated 4.6 out of 5 by 8. Rated 5 out of 5 by Cliffski from Quality. Top quality metal drill bits in a very strong case very happy so far. Rated 5 out of 5 by Anonymous from Top Quality Drills seem resilient and produce a hole true to size - what more do you need! Rated 5 out of 5 by Big hoss 77 from Best drill bits around. I bought these drill bits after them being recommended to my by a work colleague. Like he said 'you can't go wrong' and you really can't! they seem to cut through pretty much any material (apart from concrete(obviously)). The box is well made and is made to the same high quality as the bits themselves. Milwaukee really do know how to make tools and accessories. Rated 4 out of 5 by Anonymous from Seem good I bought these to go with the milwaukee drill i have. Nice handy kit to have when out on call. Case in nive rubust plastic, doesnt feel cheap like some drill kits. The drills by the look of them are cobalt, tho it doesnt state that. Bits keep there edge well especially ehen used with a cooling agent. Good that replacement bits are available in store for when one does blunt or break.